Sisig is actually a Kapampangan delicacy that’s popularity spread out all over Philippines. In Kapampangan the term sisig actually means to snack on something sour. 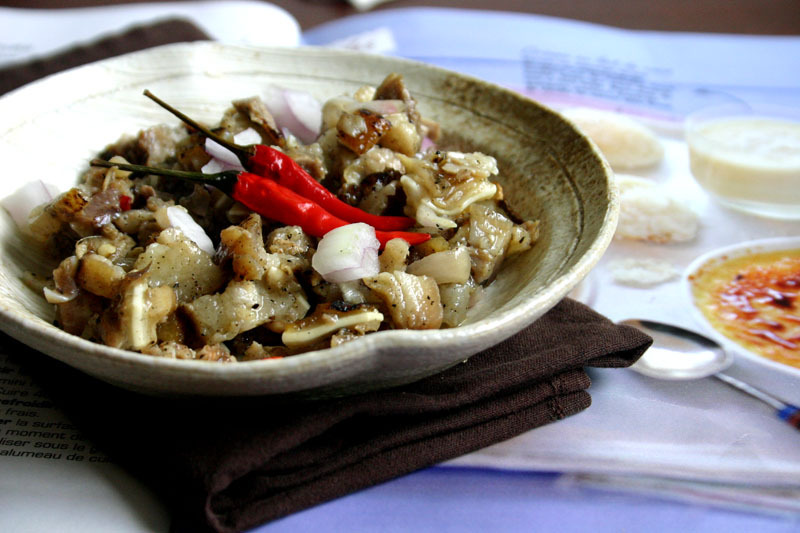 Sisig is a popular “pulutan” or an accompaniment when people are drinking beers or wine. Here’s a recipe for this Kapampangan recipe my Kapampangan friend taught me,hope you like them. There are three phase involve in cooking a sisig. The first one is boiling. Boil your pig’s cheek, ears and nose in a large casserole with water, some salt, peppercorn, onion and carrots. Cook them until they are tender. You can use a pressure cooker to speed up this task. The second phase is to grill them. Over your charcoal fire, grill your cooked pork’s part. Brown them on both sides. After this you need to chop them very thinly. The last phase needs a frying pan, put some cooking oil, sauté your onion and chopped green chilies with your cooked chopped pork. Add the soysauce, tabasco and vinegar. Before turning off the fire add your butter, decorate with sliced kalamansi and chilies. I don’t what the dish in the photo is, but it isn’t sisig. I think you put the wrong picture. This is not sisig. This looks more like stir fried beef.